Protocom 4 is useful for two AC installations in small offices / businesses, ATM centers, residential houses, for AC units of 1 or 1.5 Tons. In Logic One, only one AC is operated at a time and equal running of each AC is ensured during continuous operation. In Second logic, One or both ACs will run as per Demand. Built-in protection against UV, OV & OL for both AC units. Saves energy by alternatively using only one air conditioner (or both in case of temp rise) and that too only when it is required depending upon logic selected. Two Types of different operational logics can be selected with Protocom-1 through front Keys and display. These LOGICS are as follows. Over Temp condition is present for more that 10 minutes. If the room temperature keeps on rising even with the AC unit is in operation, it will energize OT alarm relay. It will stop running AC, ALARM LED will glow and switchover to another AC unit overriding present timing. Thus it also monitors and maintains the room temp. One AC will be running as normal running AC for set time cycle. If temp rises above OT set point. second AC is switch on as stand-by running AC. This AC will be running until temp drops below OT-Hysteresis level (LIFO). In case, both AC are running and cycle time completes, none of the AC will be switch off or no change over will take place. However if temp drops below. OT-Hysteresis set point, first started AC will be made off and running AC will be considered as normal running AC (FIFO). After Power ON POWER LED indication glows steady. Display will start showing input AC voltage, AC1 & AC2 current and Room temp with scanning time of 5 sec. AC1will become ON and will remain ON for next set time cycle. After completion of timing cycle, it will be OFF and second AC will ON. Second AC will remain ON for next set time cycle. This operation will be repeated in cyclic mode. When AC is on, respective LED glows steady. Internal timer will retain timing cycle (with resolution of 1 Hr. ) in case of power failure with built in memory retention facility. Every time any AC will be made ON after ON delay of 2 Minutes. The PROTOCOM-1 offers built-in protection against under voltage (170 VAC with auto reset gap of 6 VA C) & over voltage (270 VA C with 6 VA C auto reset gap) with 4 sec. trip time delay. Upon arising one of above condition running AC will switch OFF & 'ALARM' indication turns ON. Display shows 'uV' / 'oV' indication. Once condition gets cleared, same AC will be made ON. 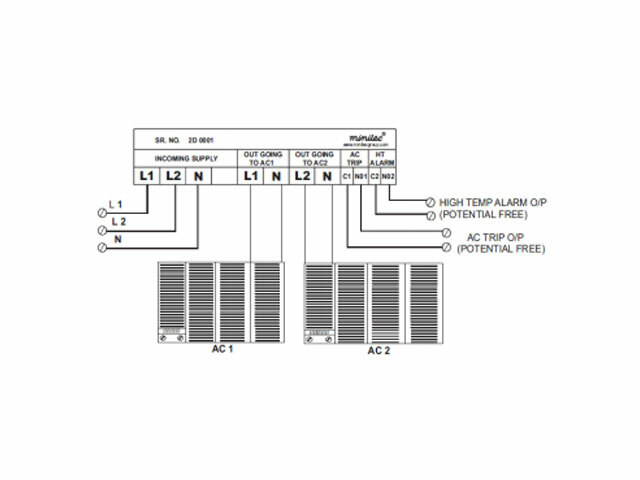 The PROTOCOM-1 protects the AC against over load condition of the set value. Running AC will switch OFF after O/L trip time delay. 'ALARM' LED will glow, display will show 'oL' indication & Alternative AC will be switch ON. Alternate AC will operate for remained time cycle & then again earlier AC will be switch ON. The PROTOCOM-4 unit operates the AC by sensing the room temperature with the help of built-in temperature sensor. After power ON or during running of any AC, the ambient temp is monitored and if it is above set OT level for more than 10 minutes, then 'ALARM' LED turns on, also OT ALARM relay gets energized. Then running AC is switch OFF assuming that it is unable to lower the room temp below the set level. Alternative AC will switch ON. It will operate for remaining time cycle. After completion of time cycle other AC will be switch ON. 'OT ALARM' relay remain in energized condition till the ambient temp reduces below the hystersis level of OT set point. In case LOGIC - 2 is selected, another AC will be made ON as stand by running AC. After arriving of above any of fault condition Fault buzzer will be ON & will be retain for 1 Minute or till clearance of fault Condition (except OL fault) whichever is earlier. Power ON Delay2 - 600 sec. 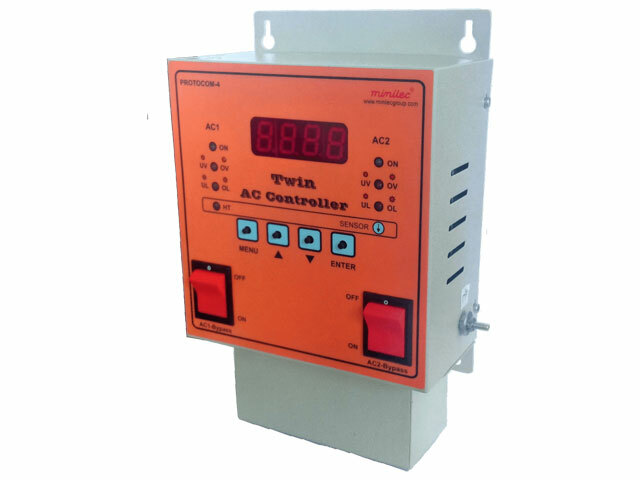 Single Phase Twin AC unit control. Energy Saving by optimal use of AC. Units.